I have the same resolution every year. 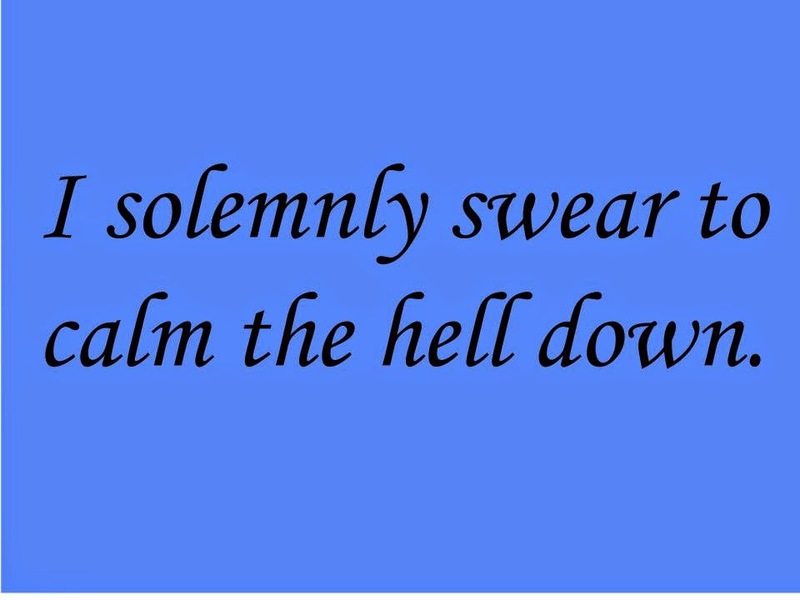 I solemnly swear to calm the hell down. My best friend and I shared it with each other, years ago, when we were freaking out about something, the way we usually do. We needed to calm each other down, talk each other down from the ledge, remind each other that life would go on after whatever tiny, insubstantial crack in our universe had resolved itself. And...I still need that reminder. Because honestly, calming the hell down, encompasses all of those promises. If I take a breath and realize it's okay to say no, then the time I do spend with those I treasure will mean more. When I remember that sometimes takeout means a saner life, I can let go of the complex Pinterest-inspired meals and simply sit down and eat with my family. When I set reasonable running goals, I make my own dreams come true. Yes, I made this promise to myself (and my best friend) years ago, but I have to keep making it, because, well, I'm me. I continue to over-commit, to over plan, endeavor to do all of the things right now and then panic. I get better, in small ways, as the years pass, but I find the resolution still holds value for me. I can't say that this will be the year I finally get it right. All I know is that I'm going to keep reminding myself to calm the hell down whenever my wee little universe starts spinning out of control.